Enjoy our beautiful clean Oceanfront condo on the 12th floor at the Antigua, in Ocean City, MD. 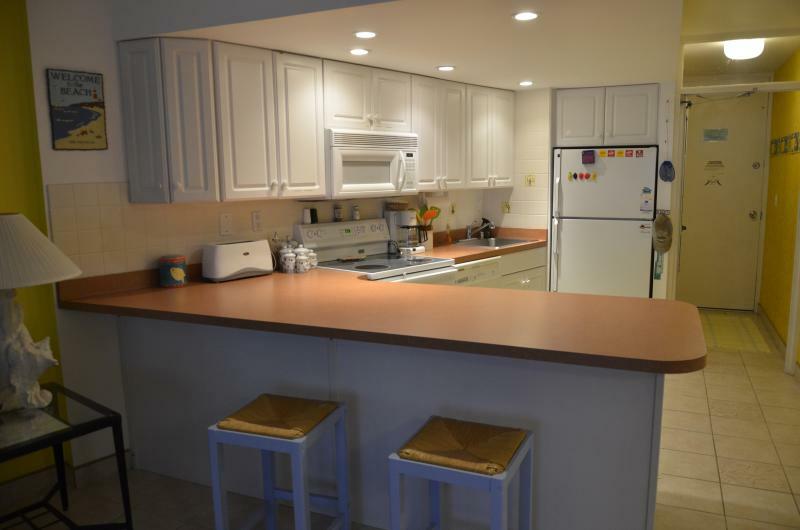 Fully renovated 2 br, 2 baths, modern kitchen. Washer, dryer, dishwasher, 2 TVs with cable, dvd, swimming pool, kid pool, sauna. Master bedroom = queen size bed. New living room furniture replaced end 2014. Spectacular southeast view of the beach, ocean, and downtown lights from the 20' bay window in the main bedroom, and 20' enclosed balcony. This is a smoke free unit. No pets allowed. The maximum occupancy is 6. 24 hour convenience, wine and beer store across the street. We are residing in Ocean City all summer, and will be available if you need anything during your stay. We have a pontoon boat on the bay side and will be more than happy to welcome you on a cruise around the area. Located close to all the summer activities, yet far enough from the noise and downtown boardwalk fuzziness. The Antigua in not part of the Ocean City Condo Row, so the sand and beach are always very clean and a lot less crowded. Enjoy a relaxing time on the beach, go offshore or bay fishing or enjoy the fishing tournaments, check the dolphins swim close to shore, tee off from full size or mini golfs, shop and have fun at the arcades on the boardwalk, savor crabs and seafood at local restaurants, venture to Assateague National Park and watch the wild horses, shop the outlets. These are only a few minutes away from our unit. We only offer full week rentals. From our unit, you are only a few minutes away from the boardwalk. You can easily access by car, taxi, or by bus, whichever is more convenient for you. Feel free to contact you if you have any questions getting to our unit. We are close to most activities in Ocean City, but still far enough to avoid all the noise and commotion of the boardwalk. Our beach is very clean and never crowded. We are residing in Ocean City all summer, and will be available if you need anything during your stay. We will welcome you at your arrival and visit the unit together to confirm everything is to your satisfaction. We are only a few minutes away if you ever need anything. We will be glad to answer any questions you may have and will do our very best to make you stay very pleasant and memorable. The wife and I had the pleasure of staying a week in August '17. We were busy each day sometimes at the beach, sometimes at the boardwalk, sometimes fishing. I was able to catch my 1st Tuna and Flounder with the condo owners connections and guidance! What a wonderful area, we felt safe and comfortable all week weather we were on the beach or in the shopping areas looking for deals. The beach is just steps from the elevator door, no need for a cooler, just go back for your next iced tea. Went the sun gets too hot just hit the pool or the hot tub for a change of pace. The ocean water was clear, the beach was clean and the waves were great for body surfing... I even found a couple of Boards to use in the closet! The restraunts in the area are great, but you can also cook a full meal In the condo if you like. the view of the beach and the lights at night from the 12th floor are awe inspiring... You may want to stay right in bed and soak up the sun rise every morning.. We enjoyed our stay so much we have already booked the week of the White Marlin open in 2018... Can't wait to refresh our memories of this wonderful place. Owner's reply: Matt & Theresa were very friendly guests. It was always a pleasure having them around. They took great care of the unit during their stay. They are always welcome . Looking forward to see them again next summer. Owner's reply: Thanks for your review. We really appreciated you taking good care of our unit during your stay. You are welcome anytime. What a wonderful place to go for vacation with the family! Ocean City is a great place to visit and the condo is very well situated in a very quiet place. The condo is in perfect condition. Thanks for our very nice week, it was our first visit and probably not the last! Owner's reply: Great family. Very respectful and fun to know. You are welcome anytime. Our first visit to ocean city and this definitely won't be our last. The condo was perfect, simple, clean, and an amazing view all at the right price! Thank you again for sharing your beautiful slice a paradise with our family! We hope to be back next year! Condo was very clean, beautiful view to ocean. Owners went above and beyond to make our stay extra special. They took us on their boat fishing , & clamming and to their house for a BBQ . Such sweet people highly recommend renting from them. We will definitely be back. Gerry & Lilliane treat their guest like family. And have a beautiful condo. Can't wait to go back! This Condo was a great opportunity for my wife, child and mother-in-law to really enjoy. All the beds were comfortable. The master bed room overlooked the ocean and we saw a beautiful sunrise every morning. There was a telescope in the bedrrom. Next to the master bedroom was the balcony that shared the same gorgeous view. We were 3 miinutes off the beach. There was a place to wash your feet and take a shower in the pool area. Parking was convenient and the building structure looked like the bldgs in Japanese movies. The kitchen was stock with appliances, the tvs were great and the owner's provided boogie boards. The rooms were very roomy and comfortable. The colors of the condo were bright and cheery, like the the beach! We are planning on looking for a date for next year. The location is very convenient to restaurants, super markets, gas stations and fun areas. This part of the beach is not crowed at all and everyone seemed to be friendly. The lifeguards were position right in front of the condo, so we felt safety for our child. In addition, there are cameras all along the outside, elevator, pool and general areas. It is a safe place to stay. Owner's reply: Thanks Derrick for your review. We strive to make our guests stay as enjoyable as possible. We greatly appreciate your comments, and we look forward to welcome you again whenever you decide. Owner's reply: So glad you enjoyed your vacation. We try to take great care of our unit, and having such nice guests makes it all worth while. We greatly appreciated how clean and tidy you left the unit. You are the kind of family all owners are looking for. You are welcome anytime. Rented the condo for a week in July. Was absolutely perfect! Very clean and just as it was pictured! Couldn't get any better owners either! 12th floor overlooks the ocean, beautiful views! Just perfect is all we can say! We will definitely rent again from this owner! The owners of this condo went above and beyond for our vacation. We celebrated our son's birthday while on vacation and the owners were a big part of that. They took us for a boat ride and allowed each of our boys to be "Captain" of the boat for a while. They took us around the bay and to Assateague Island and to the Inlet. After the boat trip, the owners had a BBQ for us and also baked my son a birthday cake. They made my son's birthday very special. The condo was nice with a spectacular view of not only the ocean but the beach looking south. The owners spent at long time cleaning the condo so it was very clean. Owner's reply: The Stewards were such a nice and friendly family. We enjoyed their company and the memories of their vacation would last a long time. They are welcomed anytime. The condo looks exactly as the photos show. We had everything we needed for a great vacation, although I do wish there were wifi. Gerry and Lilianne are friendly and accommodating. I would definitely stay here again. Owner's reply: Our guests are like family. We want them to feel at home and enjoy their stay as much as possible. Patti, you were very pleasant and friendly. You're welcome anytime. Estimated price per night based on a weekly stay. Owner fees of $85.00 per stay may apply. Enter your dates to see the total cost.